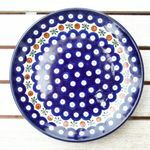 Polish pottery dishes spread a feeling of comfort and tradition in the room. All pieces are still produced using traditional methods in Boleslawiec in Silesia by hand. Typical of the ceramic pieces is the classic decor, which may have small irregularities due to the hand work. These small "error" make Polish pottery something unique and give it its distinctive character. 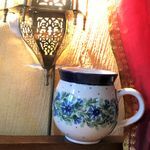 Polish pottery is heat resistant and robust and therefore very suitable for everyday use. Of course, our entire product is dishwasher, oven and microwave safe.